Kyocera offers two advanced applications, ColorLock and AccessLock, utilizing its HyPAS (Hybrid Platform for Advanced Solutions) technology for select Kyocera multifunctional products (MFPs). With these new applications, organizations can have better control at the device level to manage color usage and access to the specific device functions, including printing, scanning and faxing. Promotes efficient and cost effective device usage through applications that address an array of user and administrative requirements. Designed to address the growing transition from black-and-white to color document imaging solutions, ColorLock is a device management application that allows organizations to control access to color functions. 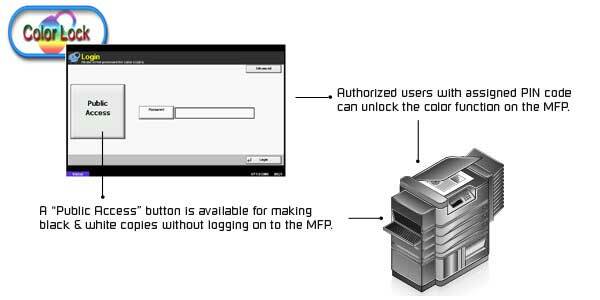 This is achieved by offering a log-in screen that requests users to enter a passcode before they can use the MFP and only allows color capabilities to authorized users. By allowing network administrators to designate which users can access color, businesses can implement color capabilities to their work environment while controlling the associated costs of color consumables.